A jade plant (Crassula argentea) is a tough succulent that is one of the easiest plants to grow indoors. The plant thrives on neglect, making it a great choice for a first-time houseplant owner. While forgiving of neglect, the jade plant is not an ugly duckling, it’s quite an attention getter and can reach a mature height of five feet. It can be kept pruned to a smaller, table-top size if desired. A jade plant is grown to bring good luck to the owner, but you won’t need to good luck to grow this hardy succulent when you follow these care tips. Jade plants are quite popular and can be purchased almost anywhere potted plants are sold. they typically come in a small, decorative pot and will soon need to be re-potted into a larger container to accommodate its expanding root system. Select a new planting container that is twice the size of the original container. Fill the new container with cactus soil to which organic matter, like compost, has been added. You can also mix your own potting soil with 1 part soil, 1 part peat moss and 3 parts coarse builder’s sand. Remove the jade plant from its container by turning the container upside down, then grasp the stem near the soil level and gently pull. Make a hole in the center of the potting soil in the new container and set jade plant inside the hole at the same level in which it was. Fill in empty spaces with potting soil, firm soil around plant roots and water well. Jade plants grow best in a location that provides them lots of direct sunlight. A spot on the window sill of a west-facing window will provide the plants with enough afternoon sunlight to meet their growing needs. If west-facing sun exposure is not possible, place the plant in an east or south-facing window sill. A northern exposure will not provide the plant with adequate sunlight. If the plant does not receive enough sunlight, it will become leggy and misshapen. *Note – move plant away from window during the winter months because the air temperature may become to cold for the plant. Like all other succulents, jade enjoys both sunshine and warmth. Plants will grow best in a location that provides them with a day time temperature of 65-75 F and night time temperature of 50-55 F. When located in direct sunlight, the plants will become warmer than 75 F and that is perfectly acceptable. Keep plants away from heating and cooling vents and away from doors that open to the outdoors. Either location will cause the jade plant to be receive blasts of cold or hot air which can cause it to become stunted. Feed your jade plant every six months, once in the spring and then again in the fall. Use a balanced water soluble plant food formulated for succulents. The main thing to keep in mind at feeding time is that you should water the plant like normal and then apply the water soluble plant food. The plant roots will be damaged if it’s fed when the soil is dry. The plant will be actively growing during the summer and will require regular watering. Keep the soil moist, but not soggy, during the summer. Reduce the frequency of watering during the winter when the plant growth is dormant. Water only when the top of soil becomes dry. The jade plant has wide, fleshy leaves that catch dust particles from the air, making it needful to clean the leaves on occasion. Dampen a soft, white cloth with warm water and gently wipe down each leaf to remove dust. All green plants take in oxygen (transpiration) through their leaves and if the leaves are covered with dust, plants will become stunted and potentially die. Pinch off new growth to encourage your jade plant to develop lateral branches and become thick and bushy. This will also prevent the plant from becoming leggy and misshapen. The top can be pinched off occasionally to keep plant at a desired height (it will reach around five feet tall if top is left intact). If you want the jade plant to reach its maximum height, it may become top heavy and may need some support during the growing process. Purchase a wooden dowel about the diameter of a finger and three feet long, stick one end of the dowel into the soil and let the plant rest its weight on it for upright support. The dowel can be removed when the plant has reached its mature height. Making new jade plants (plant propagation) to share with others is very simple. Snip of a small section of the plant’s root and place it in moist sand. Keep sand moist and warm until new growth emerges, then transplant into a new container that is filled with the potting soil mixture mentioned above. Jade cuttings will roots in water, however, the plants propagated in water rarely survive after being transplanted into potting soil. 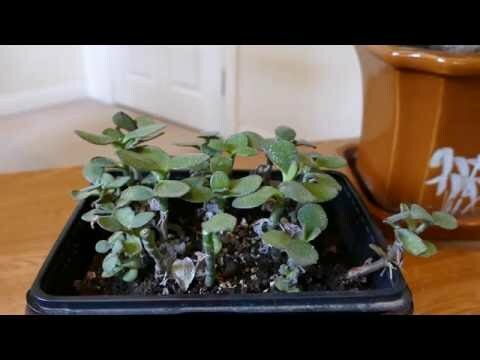 Jade plants are prone to develop white spots on their fleshy green leaves, and there are a couple of reason (with easy solutions) for the problem. If plant is watered with water or fertilize that contains salt, a salt residue will be left on the leaf during normal transpiration. Wipe white-spotted leaves with a soft, damp cloth to restore the appearance of the foliage. Oedema is a condition that can cause white spots on jade leaves. Oedema disorder on jade plants occurs when the roots take up water faster than the plant can use it. As a result, corky blisters form on plant foliage. Reduce water to prevent the condition from worsening, but the white blisters will remain. Buy yourself a lovely jade plant and you’ll have the largest and healthiest one around when you follow these simple growing tips.